All Biscuits, in all shapes and forms, from Savoury to Gluten Free and Sugar Free... and not forgetting Savoury and Biscuits for Cheese!. See our range of stylish Biscuit Tins here. From local West Country specialists Moores, though to Walkers best Shortbread. The Cheese and Wine Shop has a great range of Cakes, from rich fruit cakes to Sticky Lemon Cakes, along with our ever popular Afternoon Tea cakes; see our selection here. We also have elegant 1, 2 and 3 tier Cake Plates, just right for presenting Afternoon Tea on! delicious Biscuits for everyday enjoyment, or choose something for that special occassion. Walkers Shortbread and Cakes are world famous. 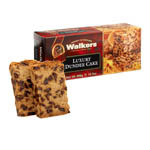 Since 1898, Walkers mission has been, "To make the world's finest shortbread.” We have a great range of Walkers products available for next day delivery. Buying Walkers Shortbread, Cakes or Biscuits, then The Cheese and Wine Shop has it covered!